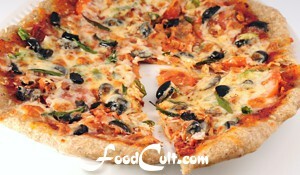 Galganov's Easy Recipe for Basic, White Wheat Pizza Dough! pizza crusts (depending upon how thick or thin you like your crust). While waiting for your yeast mix to soften, prepare for the next step (crush or measure your garlic and other ingredients). 1 crushed clove of garlic (or ½ teaspoon of garlic powder). Beat with a wooden spoon or whisk until all ingredients are blended. At this point you may have also added (or may now add) any herbs or other flavourings you might enjoy in your dough. To the mixture add 1 cup all purpose flour. Beat with the wooden spoon (or whisk) until the mixture is smooth and cascades of the back of the spoon (approximately 90 firms strokes with a spoon) or with the whisk until everything is fully blended. With a wooden spoon stir in 1 more cup of all purpose flour until all the flour is absorbed by the dough. Add in 1/2 cup flour, then 1/4 cup at a time - first with the spoon and then by hand until the dough is no longer sticky. Turn the dough out onto a lightly floured board and knead with a "push and turn" motion until the dough begins to feel responsive under your hand - about 5 to 8 minutes (5 minutes with a dough hook). The dough should have just enough flour so that it is not sticky when kneading. Dust the dough lightly with flour during the kneading process if you find it sticking to your hands. Lightly coat the dough with remaining oil (1 teaspoon) and return it to the bowl. Cover the bowl and put it in a warm, draft-free spot to rise for 70 minutes or until doubled in bulk. Knead out the bubbles and divide the dough in half (for 2 - 14" (35 cm) pies. Cover the dough with a towel. Let the it rest for 5 minutes. We like to use organic. This, by default, is always unbleached. Parchment paper means that you can slide your pan baked pie onto a stone for finishing ... finishing on a stone creates a nice, crisp crust. Check the Pizza Tools Page for pizza tools like pans and knives ... and how to use them. Remember, a stone MUST be started in a cold oven! This dough was the onset of our pizza adventure. It started with a recipe my mother clipped from the Montreal Gazette in the early '50s. As she was wont to do, she stuffed it in a drawer with heaps of other recipe clippings. There it sat for about 20 years when we stumbled across it. It was to be another (roughly) 19 years before I actually tried it out. I made it a few times ... forming and freezing the extra crusts because there was always too much. Then one day, long after having emmigrated from our home town, a neighbour was visiting for dinner. He told us of his sister - a successful pizza restaurant owner who put garlic powder in her crusts. This started a whole raft of new ideas like "fresh garlic", "fresh, minced herbs (oregano + basil) ... or dried when out of season", "a hint of cayenne". "The adventure is YOURS to have!" Drop the garlic powder. Add your favourite herb flavouring ... Create your own pizza journey! Click here for more pizza + crust dough recipes and pizza tools.